The Ware for December 2018 is shown below. Finishing off the year with a (hopefully) easy one that’s slightly off the beaten path. Happy holidays! Stay safe, and stay free. 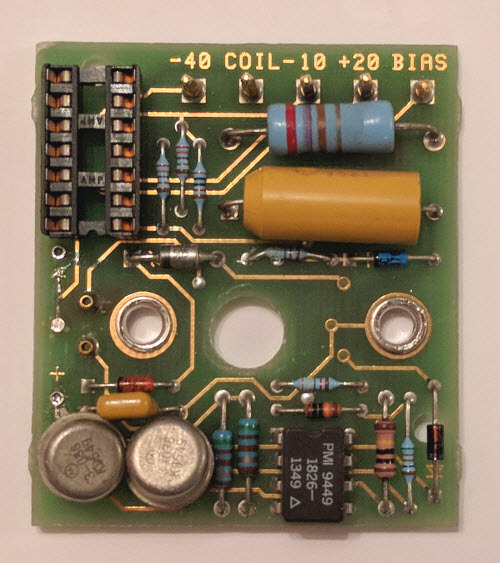 The Ware for November 2018 is a bias/control board for the HP 2-18GHz YIG-tuned multiplier. I really appreciate this fascinating ware, it reminds me that the MOS transistor is not the be-all and end-all of electronics. Of course, every day we encounter crystals as frequency references, and those are literally shaved pieces of quartz, but here is a sphere of Yttrium Iron Garnet (YIG) being used as a tunable RF filter. Thanks to phantom deadline for contributing this ware, and also congrats to Brian for nailing the ware. Email me for your prize! The Ware for October 2018 is an RFID transponder; this particular model was originally used in the early 2000’s in Colorado. Congrats to Barry Callahan for guessing it, email me for your prize!